The Door Industry Journal: Fastest industrial building on the block? Anything else usually takes months of design, planning and building. Now there is something else that encompasses the benefits of both solutions – speed, cost, flexibility and remaining on-site. Aluminium framed industrial buildings provide an industrial building solution that can be transported and delivered to site and installed in under a week. With hire contracts available these industrial buildings can be kept for as long as needed and returned in exactly the same fast and non-disruptive way, but in reverse! Hard to believe, especially when the commercial benefits of such speed and flexibility start to hit home. Combine this with the huge up-front cost savings compared to a more traditional structure then it become a serious contender for an overall business strategy. So why aren’t more people using aluminium framed industrial building? Two reasons, awareness is still relatively low and secondly, some people who are new to these buildings have a question mark over quality. 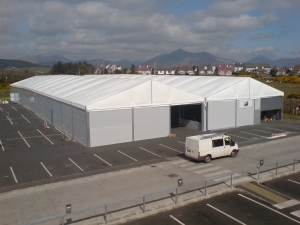 If they get as far as speaking to a provider of aluminium framed industrial buildings they will find that these remarkable structures have an indefinite lifespan and meet all the required standards for structural safety - meaning they can legitimately be used as an alternative to a permanent building. All of which not only makes aluminium framed industrial buildings the fastest and most cost-effective way to expand operational space, but potentially the only sensible choice in the uncertain economic climate.